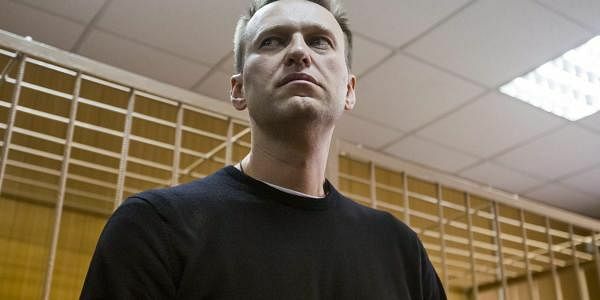 Navalny was arrested Sunday as he walked to a protest in Moscow and spent the night in jail before appearing in court. Russian opposition leader Alexei Navalny, who organized a wave of nationwide protests against government corruption that rattled authorities, was jailed for 15 days on Monday by a Moscow court for resisting police orders. Journalists and well-wishers on Monday packed the courtroom in central Moscow where Navalny was taken. He posted a selfie on Twitter from the courtroom, saying: "A time will come when we'll put them on trial too — and that time it will be fair." The 40-year-old Navalny, Russia's most popular, charismatic opposition leader, has been twice convicted on fraud and embezzlement charges that he has dismissed as politically motivated. Navalny, who is currently serving a suspended sentence, has also recently announced his bid for the presidency in Russia's 2018 election. "Even the slightest illusion of fair justice is absent here," Navalny told reporters Monday at the defendant's bench, complaining about the judge striking down one motion after another. "Yesterday's events have shown that quite a large number of voters in Russia support the program of a candidate who stands for fighting corruption. These people demand political representation — and I strive to be their political representative." The Kremlin has dismissed the opposition as a Westernized urban elite disconnected from the issues faced by the poor in Russia's far-flung regions. Yet Sunday's protests included demonstrations in the areas that typically produce a high vote for President Vladimir Putin, from the far western city of Chita in Siberia to southern Dagestan's capital of Makhachkala. The Kremlin has lashed out at protest organizers, blaming them for putting lives at risk by inviting people to unsanctioned demonstrations. Putin's spokesman chided the organizers for inciting illegal acts. "The Kremlin respects people's civic stance and their right to voice their position," Putin spokesman Dmitry Peskov told reporters. "We can't express the same respect to those who consciously misled people and who consciously did it yesterday and provoked illegal actions." Peskov defended the Russian police in riot gear who were seen manhandling protesters, some of whom were minors, calling their response "highly professional and lawful." Asked about the Kremlin's reaction to the wide geography of the protests, something that has not been seen at least since 2012, Peskov said "the Kremlin is quite sober about the scale of yesterday's protests, and are not inclined to diminish them or push them out of proportion." Russian state television completely ignored the protests in their broadcasts on Sunday, and authorities didn't comment on it in any way. Over the years, Navalny, a lawyer, has evolved from a lone blogger to someone who leads a group of like-minded activists, the Anti-Corruption Foundation, whose full-time job is to investigate official corruption. Separately on Sunday, police arrested Navalny's associates who were at their office, setting up and monitoring a webcast of the Moscow rally. Thirteen of them spent the night at a police station while authorities raided their office, reportedly removing all equipment. It wasn't immediately clear what charges they may be facing.